The light colored flea beetle “Pyrrhalta” sp. 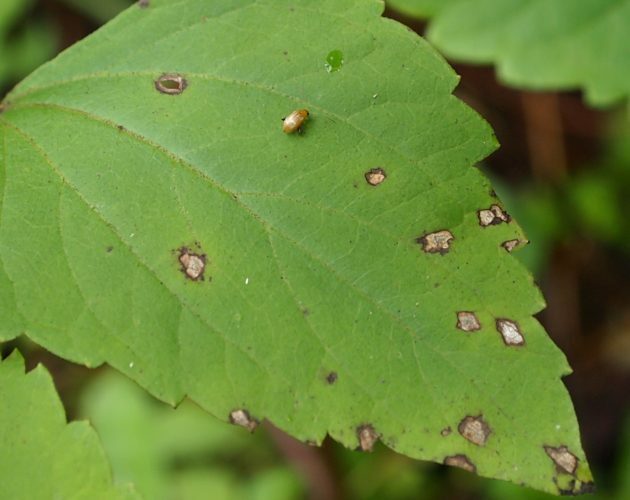 in close proximity to the damage it has caused to a leaf of the plant “Viburnum japonicum” in Japan. Camouflage is a valuable survival strategy—just ask a chameleon. Scientists have just discovered a new form of mimicry camouflage: beetles that hide by chewing beetle-shaped holes in a leaf. The holes function like body doubles when predators swoop in. Since Darwin’s time, only seven types of animal mimicry have been defined by biologists, and none after the 1940s. This new form of camouflage, discovered by an entomologist working in the Smithsonian’s National Museum of Natural History and his colleagues, is so subtle that it’s been hiding in plain sight before the eyes of scientists for centuries. Close analysis of 119 species of flea beetles and the feeding damage they inflict on plants has revealed the shape and color of these beetles’ bodies are strikingly similar to the holes they chew into plant leaves. 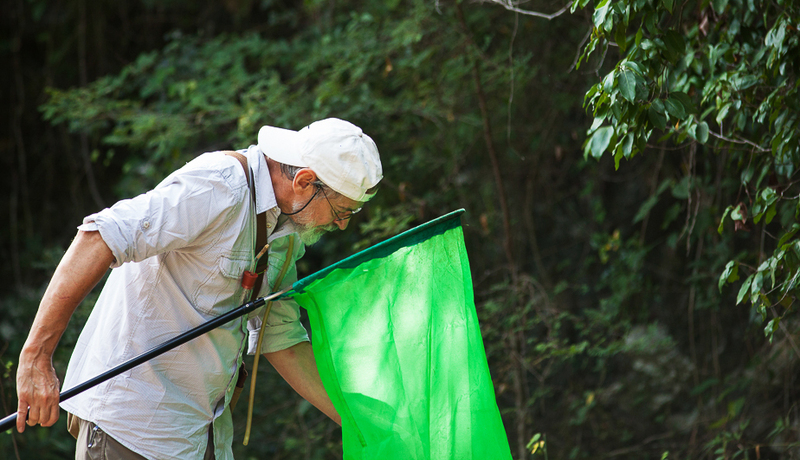 It wasn’t until a collecting trip to China in 2011 that Konstantinov noticed the beetles’ feeding damage closely resembled the insects in shape, size and color. Afterwards, he started looking for more examples. “Now I can’t unsee it. They all do it, everywhere,” says Konstantinov, lead author of a recent paper on the discovery in the Biological Journal of the Linnean Society, with co-authors K. D. Prathapan of Kerala Agricultural University in India and Fredric V. Vencl of Stony Brook University in New York. Ranging from a dark, shiny black to a pale grayish-brown, most species of flea beetles lack bright stripes and patterns. They aren’t nature’s flashiest characters—but they are among the most successful and diverse insect tribes. Found on every continent except Antarctica, the world’s 9,900 species of flea beetles make-up one of the largest individual insect groups. Scientists have long assumed the beetles’ evolutionary success was due to their incredible jumping ability. Some are able to spring nearly 100 times their body length in a single bound. 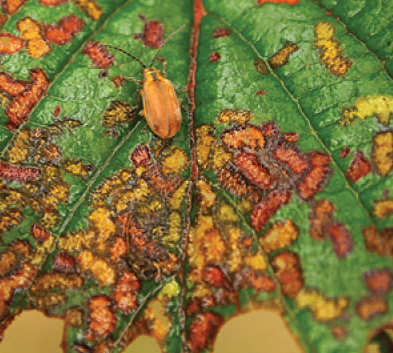 Now, researchers must take into account that the insects spend their lives on leaves covered with beetle-shaped chew holes. When a predator lunges for a hole rather than a beetle, it gives the insect a razor-thin window to escape. For each of the species of flea beetle examined in the study, Konstantinov, Prathapan and Vencl observed that the feeding damage caused to plant leaves was roughly the same width and length as the beetle that created it. 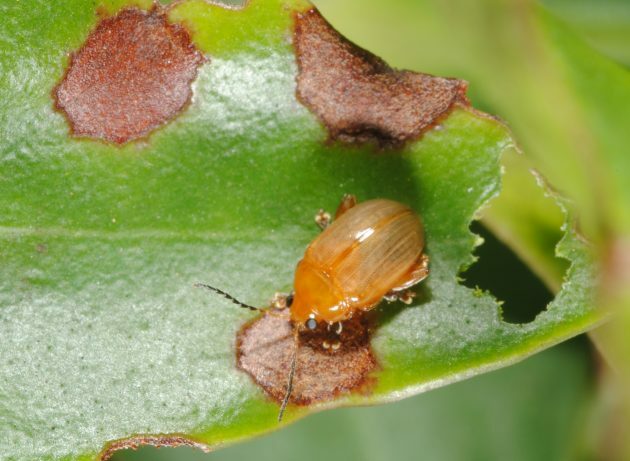 Light-colored beetles also make shallower holes for lighter-colored leaf damage, while dark-bodied beetles chew the leaf through, resulting in darker holes. Scientists believe beetle bodies evolved to resemble the feeding damage at the same time as they evolved to chew beetle-sized holes in leaves. The light flea beetle “Haemaltica” sp. and its damage to a leaf of the plant “Memecylon” sp. in Karnataka, India. Konstantinov and Vencl also suggest that the small size of the holes gives beetles another important protection: avoiding chemical plant defenses. Because the beetles’ feeding habits cause constellations of small, stippled holes in a leaf instead of a single large chewed-up territory, it may prevent a plant from protecting itself by unleashing toxins or other ways to repel insects. And as they rely on the surface of the leaves during their entire life cycle—for food, for mating, for laying eggs—this feeding strategy has turned out to be a winning tactic on both sides of the survival equation. 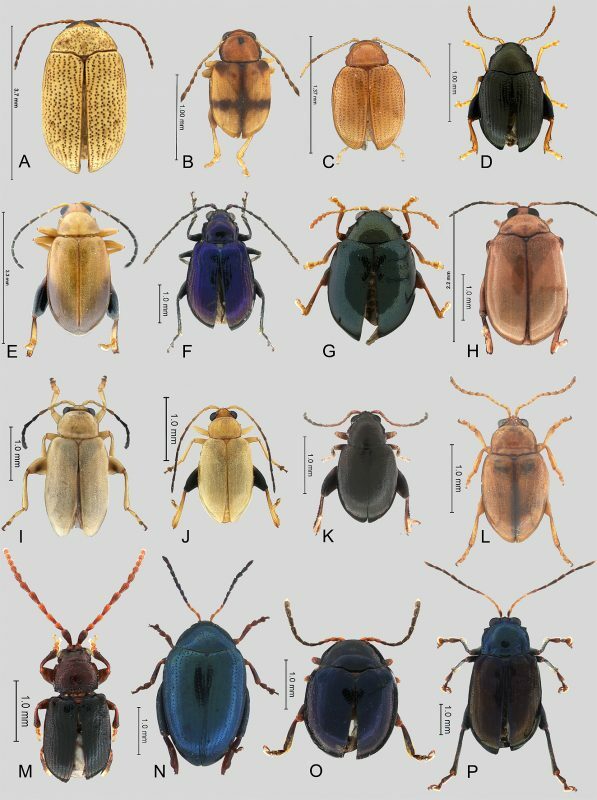 Vencl says that while he was initially skeptical the beetles were creating masquerade decoys, the study revealed the same patterns happening even in different genera of flea beetles, indicating an independent origin of the strategy. That means the decoy strategy may have aided in the huge diversification of species of this type of beetle. The light colored flea beetle “Longitarsus” sp. masquerading as feeding damage to the plant “Ageratina” sp. in Yunnan, China. The new work could also be useful from a pest-control standpoint: flea beetles are considered significant pests to many agricultural crops. 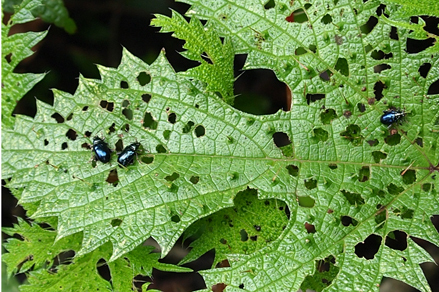 Konstantinov suggests that perhaps plants could be manipulated to respond differently to the beetles’ feeding damage, resulting in holes that don’t resemble beetle bodies as closely. Predators could discern them more easily, and growers could use fewer chemical controls. As for officially naming this new camouflage type, Konstantinov says it is an ongoing discussion among the authors and colleagues in the National Museum of Natural History. He says this totally new form of disguise demands a distinct, descriptive name. Focal light and dark flea beetle species. A, light: “Apraea portoricensis” (Blake). B, light: “Centralaphthona crucifera” (Blake). C, light: “Centralaphthona” sp. D, dark: “Chaetocnema confinis” Crotch. E, light: “Chanealtica cuevas” Konstantinov. F, dark: “Diphaulaca” sp. G, dark: “Gioia” sp. H, light: “Heikertingerella” sp. I, light: “Letzuella” near lewisi (Jacoby). J, light: “Longitarsus” sp. 1. K, dark: “Longitarsus” sp. nov. 4. L, light: “Nesaecrepida rufomarginata” Blake. M, dark: “Orthaltica copalina (Fabricius)”. N, dark: “Psylliodes hyoscyami (Linnaeus)”. O, dark: “Sphaeroderma” sp. P, dark: “Xuthea yunnanensis” Heikertinger. “Self-portrait masquerade” has been suggested, as has “Shakespearean masquerade”—a reference to the playwright’s frequent use of character deception in his works. Just as new species are named when they are discovered, he says, naming new biological phenomena also makes them available for further study by others.